Summer birthday parties are usually preferred over winter parties, both by kids and their parents. The kids can be outdoors so that’s usually where the mess and the noise stay. And the kids get to use the entire yard to do whatever their hearts desire, within reason (nothing too dangerous). Even though warmth allows for a little more flexibility, that doesn’t mean a winter party can’t be just as fun, for kids and parents. Put in a little elbow grease and some homemade charm to make each decoration sure to wow your guests. You may be wondering where to find the best wintery ideas out there? If you’re looking for some craft ideas to get the kids excited about their birthday in the colder months, look no further. It’s all right here. So grab some glue and some friends to help you craft and create. Decorating can be just as fun as the celebration itself. Have enough space in your yard to build a small hockey rink? This is something the kids can have hours of fun with. Those who like ice skating can ice skate. Those who like hockey can play a game or several games. And everyone in between can either watch while sipping some hot e, too. As long as you have plenty of people to help you set up this bad boy, it will be well worth it. Cut out circular pieces of white fabric, triangular pieces of orange fabric, and other shapes and colors of fabric that resemble snowman parts. Then, make one or several snowmen that can be stuck to the wall indoors. Even in summer, kids can have their snowman. You can even make a game out of it. Pin the nose on the snowman or who can build a snowman the fastest are two great games to play. Let the kids decide which they prefer and let the laughs roll! Spray some of that aerosol snow spray on your window panes for an instant winter feel without the need to shovel the driveway. The kids will think they are snowed in! Have them get their pajamas on and sip hot cocoa as they roast marshmallows by the fire. This faux snow will give an authentic winter night feel to the party. There are a ton of DIY tutorials on YouTube that show you exactly how to make some paper snowflakes. You can stick them to the walls or hang them from the ceiling. Either way, it will feel like the snow is falling from the sky. Cut out squares from cardboard to look like blocks of ice used to make an igloo. Paint them white and glue them together into the shape of an igloo. Kids will have hours of fun going in and out of their not so cold fun house. Add glitter to everything. Sprinkle it on the table cloth, glue it to the paper snowflakes, make the indoor snowman a little sparkly. There is even edible glitter you can use to give your party sweets a little winter sparkle. Glitter will mimic the shine that you see when sunlight meets ice. Top off the birthday cupcakes with a stick of blue rock candy stuck right into the top of each cupcake. The kids will love the added sweet treat and the cupcakes will look like they have icicles attached to them. Create some edible fun with marshmallows, chocolate chips, pretzels and candy corn, which, when put together, look like a snowman. What kid doesn’t like to have their cake, or snowman, and eat it, too? 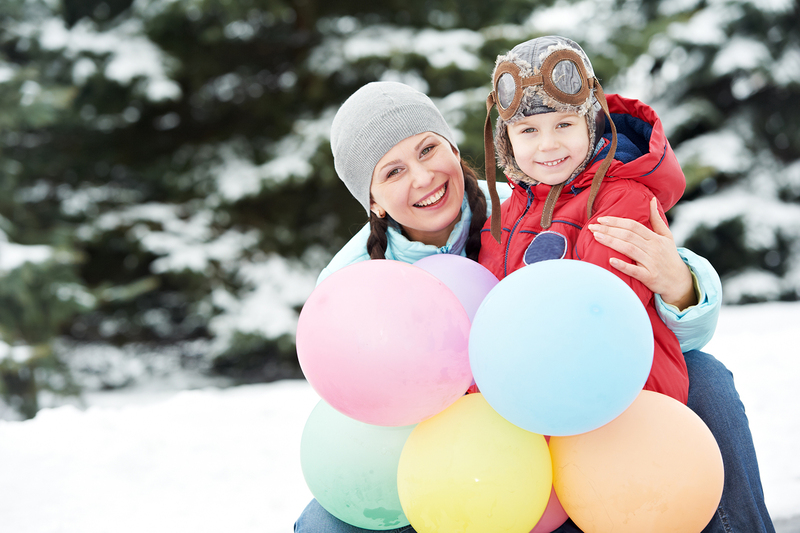 No matter which winterized crafts and decorations you choose, the above list is sure to make your birthday boy or girl proud of their birthday party, no matter the time of year. Who knew winter could be so fascinating! Next thing you know, all your child’s friends with summer parties will be copying your winter wonderland decorations. Looking for more birthday party theme tips? We have an entire section of them here. Or skip the hassle and get the easiest party you’ve ever thrown at one of our BounceU locations. Hey Nice post. Amazing ideas for birthday celebrations in winter. My son’s birthday come in winter season only and we really don’t know what to do to make fun on birthday parties. Therese are some interesting ideas. Thanks for sharing.